There is some good news for those commuting between Sarjapura Road and Whitefield via Gunjur. The Bruhat Bengaluru Mahanagara Palike (BBMP) has completed 85 per cent of the construction work of the bridge at Varthur Kodi, and the Palike expects the bridge to be open for the public from February. The BBMP started the construction of the 87 metre long bridge at Varthur Kodi, that connects the commuters between Whitefield and Sarjapura Road, in September 2018, along with the proposed road widening project between Varthur Kodi and Sarjapura via Gunjur, at the cost of `30 crore. Though the BBMP had issued the work order to the contractor in early 2017, construction has not started due to property acquisition. The proposed elevated corridor by Karnataka Road Development Corporation Limited (KRDCL) will cut through the area. The BBMP later changed the alignment of the bridge and constructed two separate bridges, both ways, to make way for the elevated corridor. 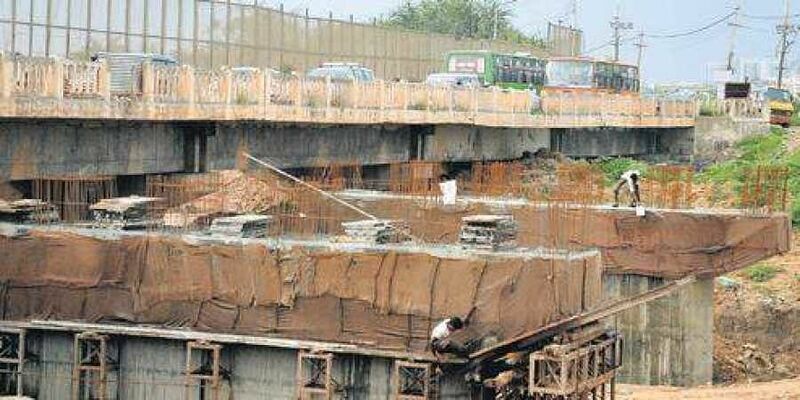 An official from the BBMP told TNIE, “The work of the bridge is almost over. The project should have started long ago but has been delayed due to various issues. Currently the Palike has finished 85 per cent of the work. We will complete the work in 10 or 15 days and the bridge will be open to the public by the end of February,” he added. Meanwhile, there is another good news for techies travelling between the two major technological hubs of the city. The long pending road widening project between Varthur Kodi and Varthur village via Gunjur, will commence, as the BBMP has finally managed to convince the property owners along the stretch for Transferrable Development Rights (TDR) in exchange of the land. The 1.4 km stretch where the road is currently about 21 feet-wide, will be widened to 160 feet (six lanes of main carriage way and two lanes of service roads on either side). The BBMP started the work in November 2017, however the work was delayed as 63 property owners along the identified stretch did not agree to TDR initially. The BBMP has convinced most of the property owners for the land acquisition in exchange of TDR.